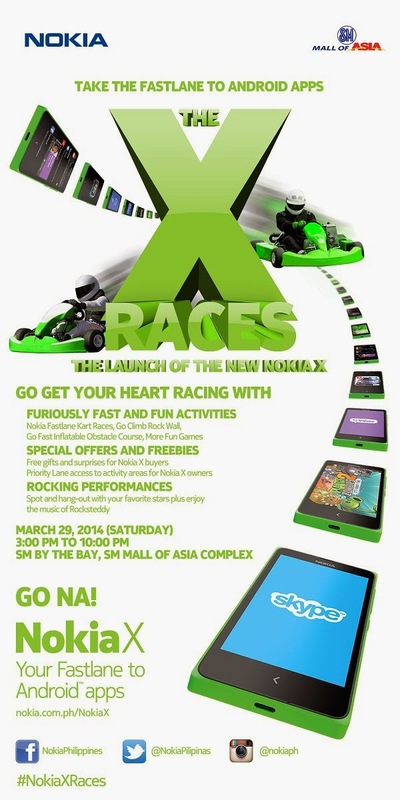 Manila, Philippines - After the successful launch of Android-based Nokia X last March 11, Nokia Philippines announced today a big event called “Nokia X Races” intended for the general public set on March 29, 2014 at the SM By the Bay (back of SM Mall of Asia) from 3:00 PM to 10:00 PM. Nokia encourages users to eXperience life in the Fastlane with the new Nokia X through the said event. The invitation sent to TheSummitExpress.com says: "It is time to Xcelerate your smartphone experience and take it to the eXtreme level with Nokia X! See how the best of Nokia design, Microsoft services, and Android apps come together via this eXhilarating and eXtra special event." Have excellent fun on ‘Nokia X Races’ event at the Go Kart, Rock Wall, Inflatable Obstacle Course areas, food kiosks, and the eXperiential Nokia X booths where you can get the best deals when you purchase Nokia X, or a chance to win cool prizes; and finally, cap your day with an eXciting rock concert featuring Rocksteddy plus other celebrity guests. GO Na! to Nokia X Races and feel the Fastlane to Android apps with Nokia X - now available in stores for P5,990 (SRP). To know how you can get your FREE passes, visit the official Facebook page of Nokia Philippines.